Want to know some more interesting facts about cola? Well, you can to the right place. Here are some other fun facts about Coca-Cola that you may not have already known. There are only two countries in the entire world that do sell Coca-Cola, North Korea and Cuba. The flavoring used in Coca-Cola is still extracted from the same plant used in cocaine. Coca-Cola is the only company allowed to import it in the United States. Coca-Cola was invented by John Stith Pemberton as a cure for headaches. Cleaning your toilet with Coca-Cola will get out stains. Do you know of any other facts about cola? If so, comment below and share with us your own Coca-Cola facts! On a recent trip south, I had the pleasure of visiting both Epcot at Walt Disney World, and the World of Coca-Cola in Atlanta, Georgia. As a Coca-Cola collector and enthusiast, I enjoy both of these attractions for much of the same reason, my love of Coca-Cola beverages and refreshments. At both Epcot and the World of Coca-Cola, there is an area where you can go and sample Coca-Cola products from around the globe. At Epcot, there is Club Cool which is a Coca-Cola sponsored refreshment area where you can not only pick up some great Coca-Cola souvenirs, but you can sample some of their products that are sold across the world. The World of Coca-Cola in Atlanta is similar to a museum with Coca-Cola artifacts and collectibles dating back to the products beginning (1886). They also have a 4D movie theatre and several fun and interactive displays and exhibits showcasing their products and history. When taking the tour of the World of Coca-Cola, they have “Taste It” room where visitors can sample over 60 different beverages sold around the world. When visiting both Epcot and the World of Coca-Cola, it is fun to see the reactions of visitors when they try some of the different refreshments. Many of the flavors are unique to guests from the United States, as there is nothing currently sold in the US that is similar to some of the beverages enjoyed in other countries. 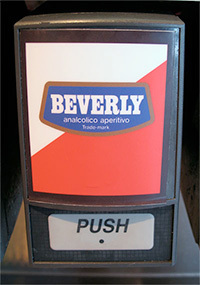 The one beverage that seems to get the most reaction from guests is one that used to be sold in Italy called, “Beverly.” Beverly was introduced in Italy in 1969 as a non-alcoholic aperitif. Aperitifs are drinks that Italians would drink before their meals to help aid digestion. Beverly has a very bitter taste to it that surprises most guests who are expecting something much more pleasant and sweet tasting. Watching the reaction of unsuspecting people is worth stopping in and getting your own sugar buzz from sampling all the different products. So if you are planning a trip to Walt Disney World, the Atlanta area, stop in at the Coca-Cola tasting areas and try a sip of Beverly, if you dare!